Rock gardens are a fantastic way of adding unique shapes and textures of rocks and garden landscape ideas that give a natural feel to your backyard or front yard decorating. The combination of rocks, plants and flowers is an inexpensive way to enhance the beauty of your rock garden design. Rock gardens are creative reflection of amazing mountainous scenes that you can enjoy everyday right outside your home. Various plants and flowers complement and enrich the neutral, calm and timeless environment created by rocks in gardens. 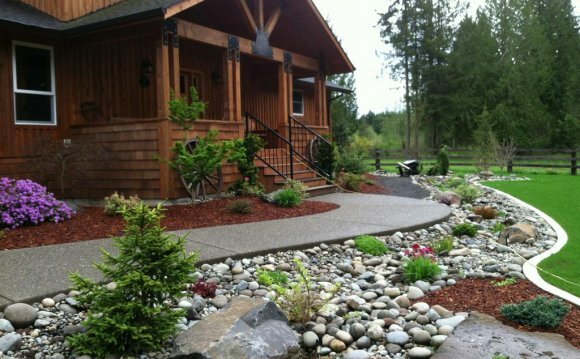 Beautiful rock gardens are very attractive when they harmoniously fit in backyard, front yard or garden landscape ideas. Garden rocks in poorly designed rock gardens lifeless and unattractive. Beautiful rock garden design is an art, so a beginner should learn the basics of how to design a garden with rocks, plants and flowers. Formal rock gardens emphasize your house exterior design and architectural features. Beautiful rock garden design make backyard, front yard or garden look more harmonious and balanced, turning natural landscape into a work of art. Formal rock gardens can include only green plants or colorful plants and flowers that bring life to rock garden landscape ideas and give a more natural look to rocks garden setting. Natural rock garden designs look informal and natural with wild plants and flowers that grow in free style. Decorative plants and flowers can be added to the natural garden design, making it brighter and more colorful. Before you design a rock garden, evaluate the potential of your site. Most critical elements are drainage, sunlight exposure, existing house exterior design and the presence of trees and flower beds on the site. Rock garden design requires a site that has good drainage. Areas such as slopes and those that are slightly raised are perfect for designing attractive rock gardens. Plants may rot or not thrive in areas that stay wet for long time. Sunlight exposure is a critical for most plants and flowers, used for rock garden design, although some plants grow well in shade. If your backyard or front yard has bright and shady areas, it is a great idea to design few different rock gardens. House exterior design and rock garden background are not as important as drainage or sunlight exposure, but they have a visual impact on the overall appearance of your backyard or front yard decorating. A large rock, brick and stone walls look gorgeous and natural, and enhance the visual appeal of a formal rock garden design. Formal rock garden requires and attractive background that you can add. A natural rock garden can be created without it. Trees and flower beds provide colors and a changing background with fall foliage and branches in winter, which make your rocks garden interesting, surprising and always beautiful. Rock garden plants for informal design add natural charm, emphasizing the simplicity and timeless elegance of rocks in the garden. Rocks garden design with blooming plants should be arranged away from large trees, which create shade and take water and nutrients from the soil, competing with rock garden plants.